I have been so caught up trying to understand the overall structure of the gun training industry and its central individuals and organizations that I have neglected the proverbial elephant in the room: the National Rifle Association Education and Training Department. At some point this past summer I realized I had never taken the NRA’s Basics of Pistol Shooting Course. So, both for research purposes and personal edification, my wife Sandy and I took the course in August. The course was taught by Tim, a former military firearms trainer now retired to a small mountain town in North Carolina. Sandy and I paid $85/each for the course and were the only students. Given the instructor’s credentials – 23 year Navy veteran who worked as a small arms instructor with SEAL Teams, Naval Special Warfare Units, and Special Operations Command South – we were a bit concerned that we were going to be taking a basic pistol course with a super high-speed/low-drag tactical operator. But Tim could not have been more down to earth, approachable, and helpful. 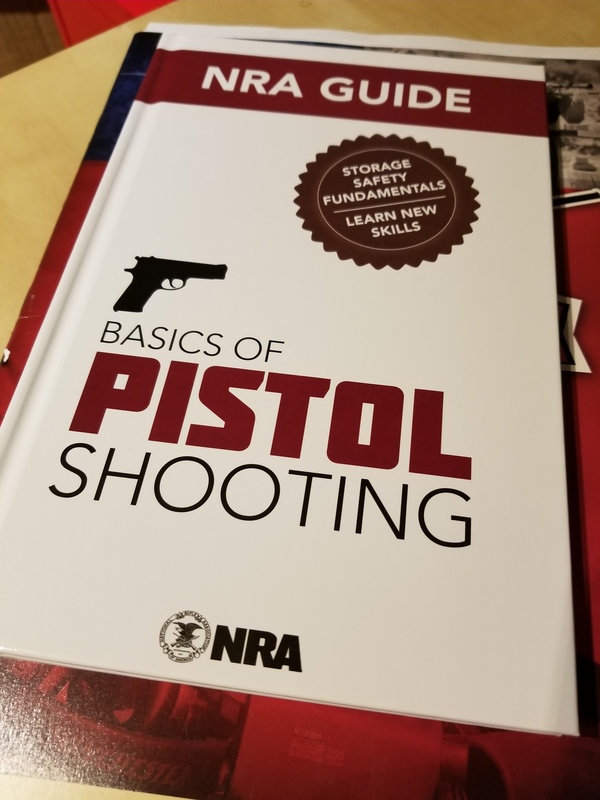 He covered the entire NRA Basic Pistol curriculum faithfully as required, but also encouraged us to ask as many questions as possible and to get what we needed out of the course. NRA Basic Pistol courses, and those who teach them, are often looked down upon by more advanced gun trainers. But we do well to recall the goal of the course: How to safely use a handgun. The course we took succeeds in accomplishing this goal. The course stresses the responsibilities of gun ownership throughout, explains the basic parts and operation of firearms and ammunition, reviews the fundamentals of shooting, and puts the student on the range with a (hopefully – more on this later) qualified instructor to teach and coach correct shooting technique. On the range, the course prescribes both benchrest and standing shooting positions, with different levels of qualification from 10 feet (Red, Level 1), 15 feet (White, Level 2), and 20 feet (Blue, Level 3). Because we are both somewhat experienced shooters, we shot benchrest and standing from 10 feet then moved back to standing from 20 feet. From both the benchrest and standing positions I was shooting high. Even though from past experience I knew not to blame the sights for being off, Tim still took a few shots with my Glock 17 to confirm that it was a user not a hardware error. He helped me to get a proper sight alignment and the problem was corrected. As is frequently the case, my shots (taken left-handed) also tended to group to the right of center. A small adjustment Tim made to get more of my finger on the trigger corrected that. Here the benefit of having someone who was a (Navy SEAL!!!!) small arms instructor really showed. Tim was able to look at my results, immediately diagnose the problem, and suggest a solution. This is something that I observed across all of the instructors at Gunsite in June, and I saw stressed in Tom Givens’ Rangemaster Instructor Development Course in May. 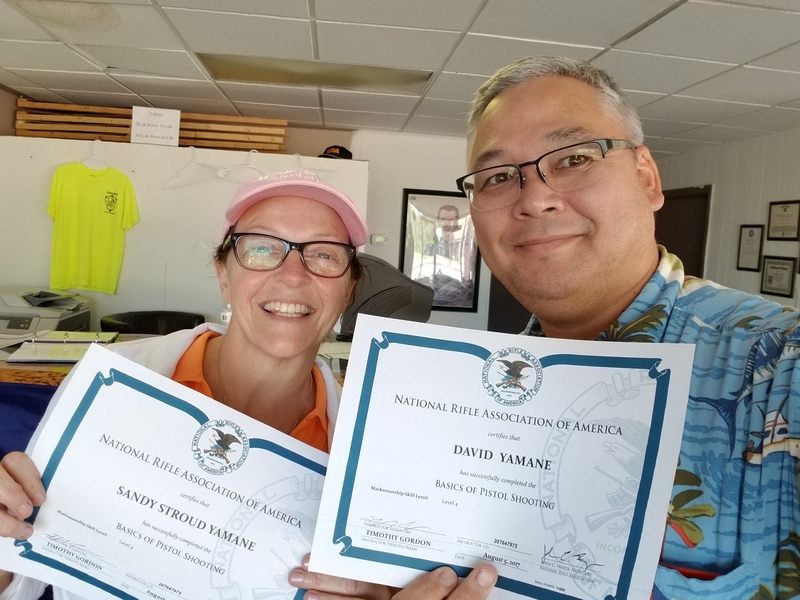 We are both interested in becoming certified instructors, not to teach for money but to have a qualification and curriculum to teach to our many friends and acquaintances who are interested in learning about guns and shooting. I am not at all concerned about teaching the classroom material; teaching is my primary vocation. I am, however, more than a little reluctant to instruct and coach shooting on the range. 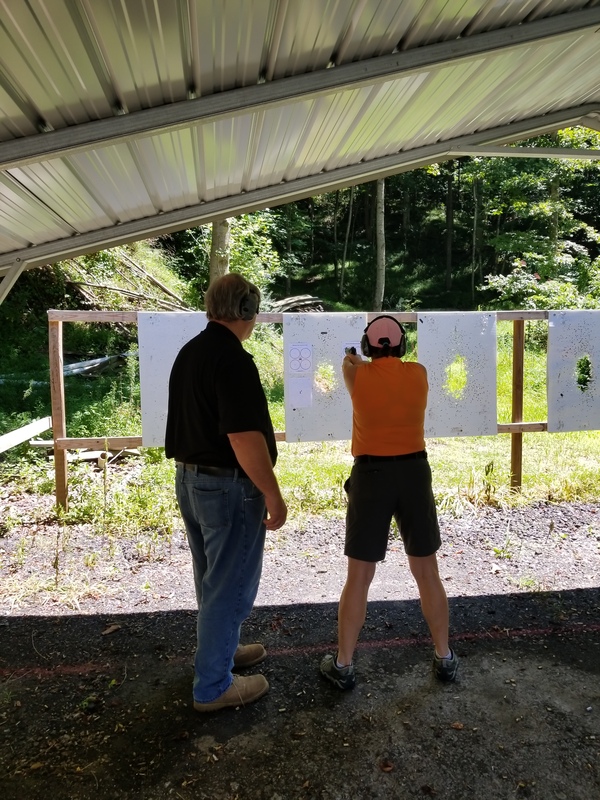 I know I cannot identify, diagnose, and solve shooting problems as well as Tim or many other more experienced shooters-qua-instructors I have observed or worked with over the years. One final thought: The NRA is often criticized for its political activities, which critics suggest is a departure from its historic founding as a marksmanship organization. But not only does politics have deep roots in the NRA as an organization (also, this here), today gun safety and gun training are still a major part of what the NRA does. And the NRA Basics of Pistol Shooting course is foundational to that. Tags: Gunsite Academy, National Rifle Association, Rangemaster, Tom Givens. Bookmark the permalink. Previous post ← There is no escaping the Gun Pretenders, Trolls and of course, the self proclaimed Subject Matter Experts on the interwebz. Very good. I am a former NRA certified IRA/IPA/ISA instructor. The purpose is meant as an introduction to firearms. Now that a foundation is set, the shooter, can understand basics, and attend other, advanced courses where advanced instructors will build upon that sound and solid foundation. I would say that most shooters who do not have any training, will tend to plink, rather than shoot, and many shooters will shoot, rather than Combat Shoot. It is similar, if I may say, that the comparison is like elementary school, junior high school, high school, and then onto college and post graduate. Along with shooting courses, if I may suggest under advisement, I recommend classes in courtroom survival. I do not know if Massad Ayoob, still teaches, but he has really dynamic videos not only on shooting, but in the aftermath of any shooting event, whether the shooter is civilian or wears a badge. Classroom work is essential in learning, and building the skill set for this martial art. Remember to always be informed of the latest and most recent laws of the shooter’s state, where they reside, and where the shooting event takes place, as laws differ, and laws are time/date sensitive, and too frequently, state lawmakers, do not have any idea of firearms or, The Justification For The Use Of Deadly Physical Force. Mas is still teaching and travelling to do so. He does so now under M.A.G. (Massad Ayoob Group). You can find him online. I (re)took MAG 40 last year here in Alaska. I had taken the classroom portion back in ’94 when it was called LFI 1. He has a good relationship with Gun Start up here and I look forward to taking the next level class when I can. Andrew Branca has his Level 1 class online and is running a Live version on the 28th for a special price. I am not affiliated with either but heartily recommend both, as they both recommend each other’s classes as they cover similar material from different perspectives.